Petro Poroshenko has been knocking on Washington’s door asking for arms ever since he became President of Ukraine in 2014. Meanwhile, for Germany and France, the prospect has been nothing less than a nightmare, Deutschlandfunk radio reported. Obama rejected Kiev’s requests for arms, sending only military instructors and “non-lethal” equipment including, radar arrays, night vision goggles and other gear. Poroshenko complained that it was not enough to win the war in Donbass. “Poroshenko and his defense minister Stepan Poltorak have since been asking for more weapons from the West,” Deutsdchlandfunk wrote on its website. Kurt Volker, the recently-appointed US special representative to Ukraine, was more attentive to Kiev’s pleas, hinting that this time around, America could possibly decide differently. On Monday, The Wall Street Journal reported that the Pentagon and the State Department had devised a plan to supply lethal arms to Ukraine, including Javelin man-portable anti-tank missiles. Europeans are as worried by possible US arms supplies to Kiev as Russia is, Deutschelandfunk continued. In an interview with Sputnik, Igor Shatrov, deputy director of the National Institute of Modern Ideology, said that the German journalists’ opinion reflected that of millions of Europeans. “Faced with Washington’s interference in European affairs, including US-imposed restrictions on their participation in the Nord Stream 2 project, the Europeans have started to realize the possible consequences of such restrictions, including in the military field. The militarization of Europe, which the US could start without asking its European NATO partners, is becoming real. 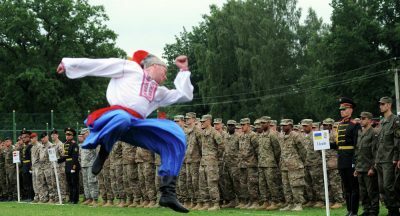 Ukraine is not a NATO member, yet the US is pursuing its own policy there, which means that with the situation permitting, it could interfere with military force,” Shatrov noted. “I think that neither Germany nor any other European country will welcome this kind of US interference in Ukraine. As the main driving forces behind the ‘Normandy format,’ Germany and France are ready to accept US assistance, but only in the form of diplomatic efforts. That’s why I believe that the opinion voiced by the German media reflects the sentiment now prevailing among the European political class,” Shatrov said. A violent military conflict in Ukraine started in 2014 after the residents of the eastern Donbass region refused to recognize the Ukrainian government which took over after the Maidan coup, during which the president of the country was forced into exile. that came to power after what they perceived to be a coup. In February 2015, the parties to the Ukrainian conflict signed the Minsk peace accords to end the fighting in the crisis-torn region.